The Tijuana Xolos will face Club America for the second time this week, this time in the Liga MX tournament. Club America defeated Club Tijuana 4-0 in the Copa MX semifinals this past Wednesday and the Xoloitzcuintles are now seeking revenge. This game is set to be distinct from that midweek cup clash as the Xolos will have the home-field advantage and Oscar Pareja should use a stronger lineup than the one he used on Wednesday night. Pareja sat out key players like Ariel Nahuelpan, Gustavo Bou and Diego Rodriguez and now all should feature in this game. The Aztec Canines are also coming off a rough loss in league play as Club Tijuana lost 1-0 to Queretaro in Week 12 of the tournament. Tijuana’s offense could not get anything going in that game, but will need to step it up in this match. The Border City Dogs have played much better at home than on the road as Club Tijuana only has one loss at the Estadio Caliente this season. Excluding the 3-0 loss to Tigres UANL, the Xoloitzcuintles have only conceded one goal at home and have won four games. The most notable victory for Oscar Pareja’s team at home and in the season was a 1-0 win against Monterrey as the team will look to repeat a similar performance. Club America has been one of the best teams in Mexican soccer this season as the Mexico City team looks to defend its league title. Los Azulcremas are coming off a huge 3-0 win against Tigres UANL in league play and that 4-0 win against the Xolos in the Copa MX semifinals. Las Aguilas have some serious momentum heading into this game with three consecutive victories in league play. Club America has inclusively not allowed any goals in these three games, but should have some injuries to key players in this game. Oribe Peralta and Roger Martinez are ruled out completely for the match while Nicolas Castillo, Bruno Valdez and Emanuel Aguilera could also miss this game. Miguel Herrera still counts with a very solid roster that features plenty of former Xolos’ players like Guido Rodriguez, Emanuel Aguilera and Henry Martin. 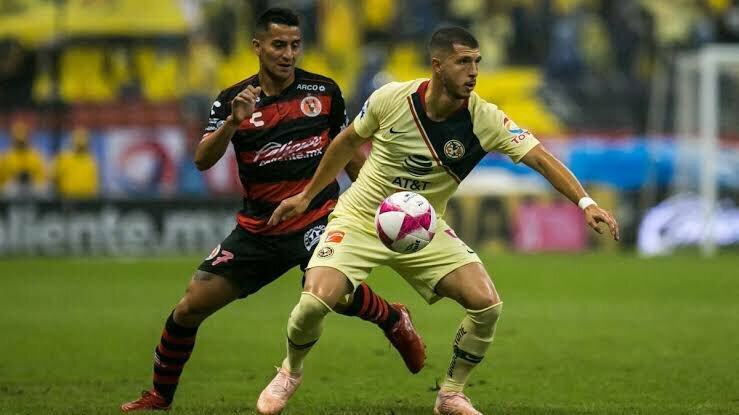 Club America is very well-balanced, but is especially good in the midfield with players like Guido Rodriguez, Mateus Uribe and Edson Alvarez. Credit: Club America Henry Martin kisses the Club America badge as he is presented with his new team. Martin scored two goals against his former team in the Copa MX semifinals during the week and could prove to be key in this game for Miguel Herrera and company. The Mexican striker is not guaranteed to get the start on Saturday night, but should given all the injuries to America’s strikers. Martin is not a very exciting player, but has very good positioning and is a very hard worker that makes him a threat inside of the penalty area. The Argentine striker sat out the midweek Copa MX match, but should definitely get the start in this match. Nahuelpan is a force with his physical presence and he will need to utilize that aspect of his game in this match as Club America can be very dangerous on set pieces. 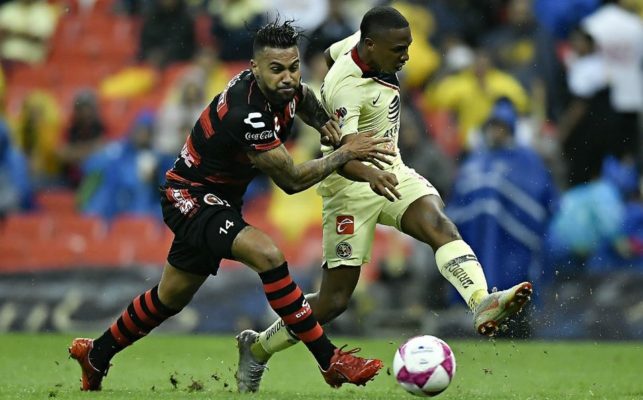 EVT predicts a 2-2 draw at the Estadio Caliente as it should prove to be a very exciting and hard-fought match at the Mictlan between Xolos and Club America.